The ThINKin' Spot: Peachy Keen Challenge #60 Let It Snow!! Good morning, again! I have another post, and another card to share with you today, and this one is for the Peachy Keen Challenge #60. We have yet another fabulous sketch to follow for this challenge, and I decided I'd jump from doing Halloween cards right into winter! Let It Snow!! Really? Well, it will be here before we know it, and I've been wanting to ink up this stamp set for quite some time now. Sorry for the crappy quality of this picture. I've been fighting some really bad lighting here, and I'm so disappointed that so many of the wonderful details about this card just don't show up in the photo. Like the acetate over the snowglobe, and the silver sparkles from my Gelly Roll pen around the scalloped border on the frame, the machine stitching around the top and sides of the card, and the Stickles glitter that secures the acetate to the paper, as well as the two sizes of pearls that flank the border on the bottom of this card. Oh well... trust me... it's ALL there! The image was colored with Copic markers, and I resisted the temptation to wrap ribbon around the top of this card and tie a knot or bow. I thought really hard about it, but decided I wanted to keep this adorable snow globe as the focus of this card, and I didn't want to distract from it one bit by adding anything else. The sketch was perfect to showcase this image, and I wanted to leave it at that. The patterned paper is from Basic Grey's Jovial collection, and the scallops around the frame I made by punching a scalloped ribbon border with kraft card stock, using my new punch from Stampin' Up!. Once I had a good length of border, I cut it down the middle and framed the panel with it. The sentiment was stamped with Very Vanilla craft ink, and heat embossed with white embossing powder. The adorable image is from the PK-321 Snowmen and Greetings stamp set from Peachy Keen Stamps, and was colored with Copic markers. 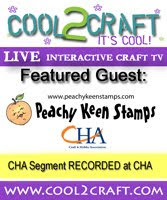 Please stop by the Peachy Keen Challenge Blog for all the details about the newest challenge, and to check out all the amazing works of my fellow designers. Please, also, join me in welcoming Cristina from Crafting with Cristina as our guest designer this week. I visited Cristina's blog and found some of the most wonderful layouts I've ever seen!! She'll have wonderful pieces of inspiration for you all week on both her personal and the company blog, so be sure to drop by and leave her some love!! It's perfect! I love it and I love that image, TFS! Lorie, this is gorgeous! Your coloring of the snow globe is nothing short of sensational! I love the card just the way it is, sans ribbon! Good choice. Well, I LOVE this card without seeing all the fabulous details you described my friend. As it stands in your photo, it's a work of art, so IRL it must be even MORE stunning!! Lorie this is amazing! I just click and whala - all the details popped right out. I just love the whole thing and as always your coloring is to die for. Anyone would be lucky to get this card! Lorie this card is amazing! I wish your camera would have captured all those details but it is such a gem just the way I see it! Good call on not adding a bow. It would have covered your machine stitching. The base of the globe looks like real wood. Just fabulous!